Residents can also enjoy the holiday season with events across South Jersey and in Philadelphia. 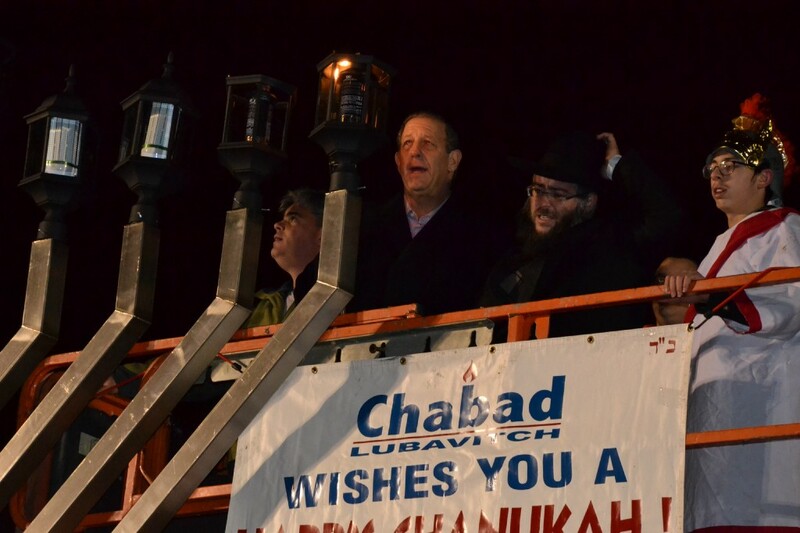 Mayor Chuck Cahn lights the Menorah at Barclay Farms Shopping Center in 2014. The 2016 Menorah Lighting will take place on Sunday. This weekend, people all across the region will be celebrating Christmas and Hanukkah. Going along with the holidays are plenty of activities for families to enjoy. Check out some of the events taking place over the holiday weekend. Residents can celebrate Hanukkah at the Katz JCC on Sunday during Chanukah Hooplah at the J. The day will include a variety of activities including a character breakfast, Fiddler on the Roof sing-a-long, and Laughter, Latkes and Lo Mein, a Kosher Chinese food dinner buffet featuring comedians Sherry Davy and Steven Scott. The sing-a-long is free and open to the entire community. Tickets must be purchased for the breakfast and dinner. For more information and to purchase tickets, visit www.katzjcc.org/holiday-celebrations. The Hanukkah Menorah at Barclay Farms Shopping Center will be lit on Sunday as Chabad of Lubavitch hosts its annual Menorah Lighting. The lighting will take place at 5 p.m. in the shopping center parking lot. Following the lighting, there will be Chinese finger food sponsored by Barclay Cafe, delicious latkes and donuts, chocolate Chanukah Gelt for children, dreidels and family fun. The event is open to the public. Visit www.thechabadcenter.org for more information. Residents can kick off Hanukkah with Chabad on Saturday night with Chanukah on Ice at the Flyers Skate Zone in Voorhees. The event will take place from 7 to 9 p.m. Guests can skate to Jewish music and classic Chanukah songs. There will also be a Chanukah art project for people to bring home. During the event, a giant Chanukah Ice Menorah will be lit. The Menorah is more than five feet tall and weighs more than 400 pounds. The cost is $10 per person in advance or $12 at the door. For more information or to RSVP for the event, visit www.thechabadcenter.org/templates/articlecco_cdo/aid/214353. Saturday will also be the final day for Strolling Santa and Carolers at the Gloucester Premium Outlets in Blackwood. From noon to 3 p.m., carolers will sing holiday classic as they stroll the center with Santa, who will greet children as he walks. For more information, visit www.premiumoutlets.com/outlet/gloucester. Saturday will be shoppers last chance to check out Christmas Village in front of Philadelphia City Hall. The village includes more than 80 vendors selling giftable items. The village will be open from 11 a.m. to 5 p.m. before closing for the season. For a full list of vendors or more information, visit www.philachristmas.com. The National Museum of American Jewish History will host its annual Being _______ at Christmas event on Sunday from 10 a.m. to 5:30 p.m. The museum will be alive with crafts, live music, face painting, balloon art, classic films, story time, and more. The cost is $12 for adults and $5 for kids. Museum members can enjoy the festivities for free. For more information and a full scheduled of activities, visit www.nmajh.org/dec25.